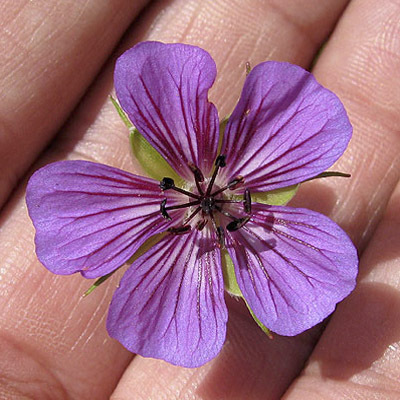 Margery Fish very wisely said “when in doubt plant a Geranium”. What great advice. 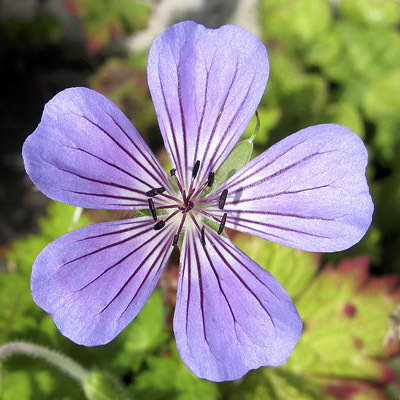 Every garden small or large has room for Geraniums. They come in a huge range of sizes from the small ground hugging G. sanguineum prostrate form and G. farreri to the huge G. psilostemon ‘Goliath’ standing about 4 feet. This range of species gives us plants suitable for small troughs to the biggest borders. Flowering usually starts in late May but there are exceptions. These are the tuberous species. 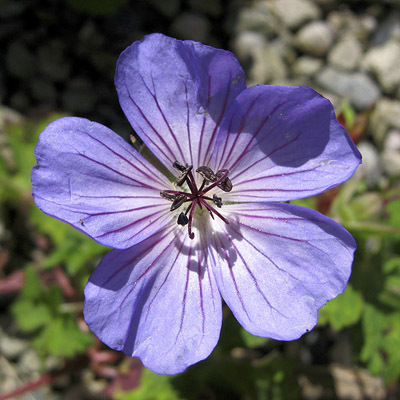 Geraniums macrostyllum and charlesii can be in flower in the alpine house from the end of March. G. tuberosum and libani x peloponnesiacum, come into growth in late winter and are usually flowering by April. Quite often they are dormant before July. These are very useful for a rockery or large trough where larger plants can become a nuisance. 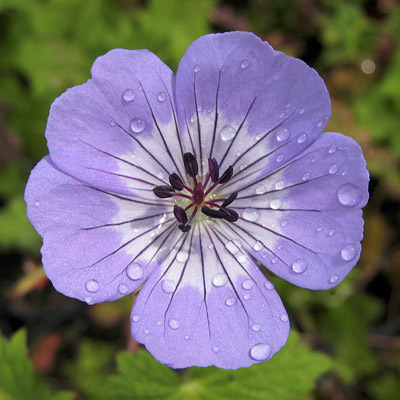 Hardy Geraniums are in growth from late April to the first hard frosts of the autumn and sometimes into December e.g. the best new introduction by far in many years is ‘Rozanne’ – note it’s with a z and not an x. ‘Rozanne’ is a hybrid between G. himalayense and G. wallichianum ‘Buxton’s Variety’. 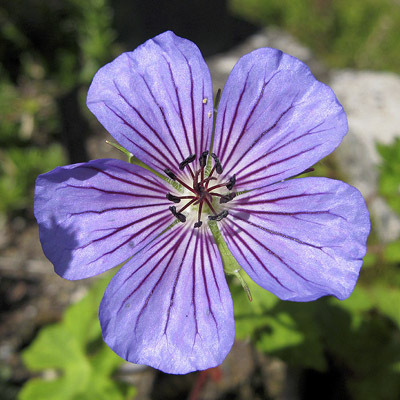 For this article I will stick to my favourite Geranium that is only suitable for a raised bed, very large rockery or a large border. I do however have a seedling that has appeared in a trough that has so far remained very small. It has flowered this year but time will tell! Everyone is familiar with G. wallichianum ‘Buxton’s Variety’ more commonly known as ‘Buxton’s Blue’. What I grow is a large variety of G. wallichianum from seeds ex Chris Chadwell from one of his Himalayan trips. The parent plant is a stunning plants and given may unusual coloured seedlings ranging from small deep pink through various blues and one of my favourites palest blue with a huge white eye. 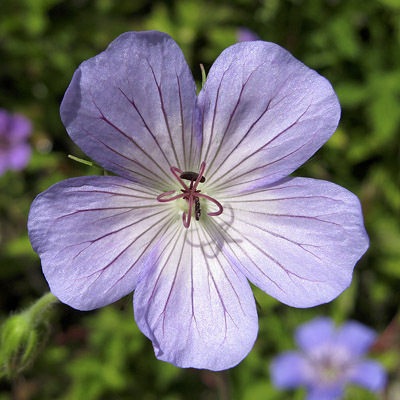 Most Geraniums respond very well to being cut back straight after flowering. This removes unwanted seed heads. Very often the plant responds with a second flush of flowers in six weeks time. This must be done when there are a few flowers left on the stems and before the seeds start to ripen.